Fire and fury in Hope County. We have spent a lot of time with Far Cry 5 in the last year. I enjoyed finding ways to mess with the sandbox in my last hands-on session. James asked Ubisoft to put his dad in the game, and then seemingly got brutally owned by Ubisoft. Recently I had another session with the game, set in an expanded version of the zone James and I have played, and came away with some positives and negatives. At the end of a mission I made my way to the front of a house I'd just cleared out, only to find the guy who gave me the mission lying incapacitated on the floor—must have taken a bullet on the way in. But as I approached to revive him I heard a boom. Then a flaming helicopter crashed just inches in front of me. I figure that having just cleared the outpost, one of my zealous NPC allies must have quickly moved in and downed the scouting enemy chopper. So far, so Far Cry. I ran around the chopper and ran over to my greasy mission-giving conspiracy theorist friend. But during the time it took for the protracted 'rescue friend' animation to play, the flames from the dead chopper had spread through the dry grass and set him on fire. As soon as I stood him up he fell to the ground and writhed around screaming in the burning grass. I retreated and patted the fire out on my own arms and could do nothing but watch and wait as the guy burned, too important to the game's continuity to actually die. Eventually he stood up, still screaming. He stood still there for a few seconds, expressionless, lips slightly parted as the blood-curdling screams of a man being burned alive came out of his manikin-like face. Then suddenly, he smiled. This exciting nonsense happens all the time in Far Cry 5, as it so often does in all Far Cry games. It's still a mad action sandbox that creates impromptu moments of insanity. Unfortunately the footage I took of these moments had some capture problems, otherwise this article would be mostly gifs of those moments. Bears rampaging through camps; NPCs somersaulting through the air after a particularly vicious gas canister explosion; enemies veering off roads under fire and crashing cars into rivers; enemies going insane and driving their combine harvester at you in a murderous rage—Far Cry's AI and physics systems manage to collide in haphazard ways that create solid action entertainment. 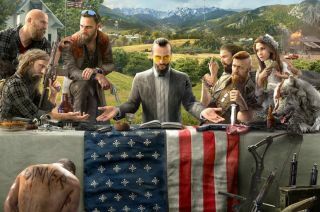 I've always liked that about the series, and it's definitely present in Far Cry 5. I chose to play with a shotgun for a lot of my session, because Far Cry 5's shotgun is surprisingly heavy and satisfying. Heaven help you if you close in on an enemy that your rocket launcher pal is also targeting. The famous Far Cry fire propagation system persists, so if you manage to avoid the blast as your mutual target is reduced to gooey particulate there's every chance the flames will get you (and any nearby enemies/pals) in the aftermath. The system falters sometimes, but didn't break during my hours with the game. I spent a while waiting in my truck as rocket launcher guy got into an involved fight with some nearby animals. I think they were wolves, but some innocent deer were definitely caught in the explosive cross-fire. I eventually drove off to continue my mission, and he spawned nearby and rejoined the fight five minutes later. I like that the system works around your movements, so you're not constantly shepherding your companions. Plus they are very sensible about maintaining stealth when you're trying to sneak up on an outpost, and you can direct them to attack specific enemies from a stealthed position, which is extremely gratifying. I started my hands-one session by driving northwest to clear out an outpost. These tend to be the best missions in recent Far Cry games, and the best ones are large compounds with clusters of guards you can sneak up on, or otherwise manipulate into traps. This was a small house with some cargo containers piled up in a back yard. It was funny to order my NPC pal to fire a rocket launcher at the enemy sniper on the roof of the building, but we cleared out the outpost from a nearby cliff edge quite easily. The noise of shooting brought everyone out of the building where they could be easily sniped from a ridge. The outpost structure has been applied to more main mission quests in Far Cry 5. I like this trend in theory, but it wasn't terribly exciting in practice. In this demo the key mission-givers were mostly under siege in a stronghold that needed to be cleared to free them up to give missions. When you approach these fights there is an opportunity to pull your binoculars out, tag enemies and make a plan, but it's a brief opportunity compared to previous Far Cry games and my options felt limited. Far Cry games have always been shooters first really, but Far Cry 5 feels like it wants to be played as an all-out shooter all the time. I missed choking guards and stealing their knives to throw at other guards. One mission involved rescuing a sniper from her perch in a church tower as waves of goons piled in on trucks to vandalise graves. Another involved fending off waves of goons in an airfield as, again, they pile in on trucks. These missions and the outpost all turned into samey shootouts with little opportunity for stealth or unusual approaches. Montana looks nice enough—the forest areas are particularly beautiful, and full of warring animals. However, as a play space I found it to be the least exciting of any Far Cry game since the very first game. The area shown off in both of the hands-on sessions I played is wide open and flat. Expect to be driving trucks around a lot of featureless farmland and navigating some gentle forested hills. Perhaps I've been spoiled by Kyrat and Far Cry Primal. I'm into the idea of a game set in contemporary America in a county beset by doomsday cults. Our Montana native James Davenport has touched on the way the game handles that setting and the political context around the story the game is trying to tell. I find that fascinating, but as a someone coming into the place cold, it strikes me as quite a bland, relatively unexciting game world to explore. In this limited demo at least there were no mountainsides to recklessly wingsuit off. Apart from one particularly hairy mission set on a sky-high broadcasting mast, there was no great vertical variation or sense of spectacle. I rarely felt the need to reach for the screenshot key. As I was moving through quests and unlocking new mission givers, I didn't feel like I was progressing much because the landscape was so similar. The demo was limited to a sizeable chunk of land in the corner of the map, so there's a chance we'll see more variation from the full game, but my time with Far Cry 5 made me want to install Far Cry 4, or Primal, to enjoy a more varied and colourful world. Far Cry 5 is out on March 27.